This icon of Norwegian nationalism actually came from a Scottish family (originally "Greig"). Grieg's grandfather emigrated to Norway in the late Eighteenth Century. Edvard (Hagerup) Grieg (June 15, 1843 - September 4, 1907) came from comfortable circumstances. His mother, a pianist, gave the six-year old Grieg his first lessons. The great Norwegian violinist Ole Bull encouraged the Griegs to send Edvard to Leipzig for further study. At fifteen, Grieg found himself at a place he disliked. He hated his piano teacher so much, he transferred to the more congenial E.F. Wenzel, who gave his student his first, crucial introduction to the music of Schumann. Grieg also studied composition with Carl Reinecke, who set him ambitious compositional tasks without giving him the necessary formal training. Consequently, throughout his life, Grieg never felt comfortable writing large-scale symphonic works or going much beyond the confines of the miniature. 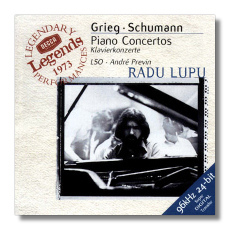 After graduating from the Conservatory in 1862, Grieg began to publish his first pieces, very much influenced by Robert Schumann and showing little of a personal voice. He began to make his career primarily as a pianist in Norway and primarily in Copenhagen, then the center of Scandinavian musical life. Here he made three crucial contacts: the Danish composer Niels Gade, friend of Schumann; the Norwegian composer Rikard Nordraak, a year older than Grieg; and a young singer named Nina Hagerup, a cousin and Grieg's future wife. To strengthen Grieg's compositional chops and to increase his ambition, Gade set Grieg the task of writing a symphony. Unfortunately, this merely exacerbated the problem that Grieg had with Reinecke. Grieg finished the symphony but regarded it as no more than an exercise. He left instructions that it should never be performed. Unfortunately, he didn't destroy the score, and it has been recorded. It's nothing much, very influenced by Gade and the less interesting stuff going on in Copenhagen at the time. His early songs and piano works succeed far more. Nordraak provided a more beneficial and lasting influence. 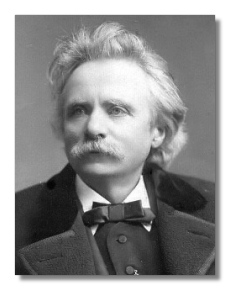 After hearing Nordraak's music, Grieg dedicated himself to the cause of Norwegian musical nationalism. Norwegian folk idioms begin to show up immediately in the Humoresques, Op. 6 (1865), although traces of Schumann linger. One can say the same for the Violin Sonata #1, Op. 8. However, the Piano Sonata, Op. 7, written in roughly the same period, carries with a stronger folk flavor. Grieg returned to Norway to try to make a career. Nordraak died young in 1866, and Grieg quickly became regarded within Norway as the country's leading young musician. He acquired piano pupils and became conductor of the Philharmonic Society, which gave him a stead income and allowed him to marry Nina in 1867. 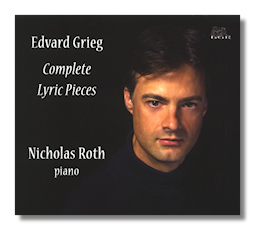 This launched a fairly productive period for Grieg: his first set of Lyric Pieces (1867), the Violin Sonata #2 (1871), the cantata Landkjending (1872), incidental music to the play Sigurd Jorsalfar (1872), a String Quartet in G minor (1878) which was to influence Debussy's string quartet, and, most importantly, his Piano Concerto (1869) and the incidental music to Peer Gynt (1875-76). Neither Ibsen or Grieg cared for one another's work, but the play has stayed alive largely due to Grieg's music, at least in English-speaking countries. The score may have cost him the most in time and effort. The piano concerto is probably his most successful large-scale work. It's obviously modeled on Schumann's, but Grieg's considerable melodic and harmonic originality absolves the score of mere imitation. Throughout his composing career, Grieg went through long fallow periods, probably because of respiratory problems that plagued him since a childhood bout with pleurisy. His stamina may also have played a part in confining him to mainly short forms: songs and character-pieces for the piano. However, he was a miniaturist of real genius, who occasionally rose to larger genres. However, his shorter pieces made him quite well off. Amateur music makers in particular, throughout Europe and America, loved his work and, what's more, bought the sheet music in large quantities. Around 1883, Grieg went through an artistic and a personal crisis. He became dissatisfied with his work, and his relations with Nina became strained to the point that he left her for several months. By the way, both Grieg and Nina were extremely short, barely five feet tall. Side by side, they looked like a pair of Dresden figurines. Percy Grainger, a fan of the composer's and a frequent guest, described him as a "mini-Viking." At any rate, in January of 1884, composer and wife reconciled. The suite From Holberg's Time dates from this period. The 1890s saw a new nationalist phase in Grieg's output. The music is more visionary, more progressive harmonically. Works from this period include more sets of Lyric Pieces, many arrangements (recompositions, actually) of Norwegian folk songs, the Old Norwegian Folksongs with Variations (1890), Symphonic Dances (1898), Slåtter (1902-03) and, above all, the song cycle Haugtussa (1895-98). In 1900, Grieg's health deteriorated, but he still undertook long concert tours. In fact, he may have found himself incapable of staying away from his public, large and adoring. He died, about to leave for England, in 1907.